Immunoprecipitation of Jurkat cell lysates using Mouse IgG (Sepharose® Bead Conjugate) #3420 (lane 1) and Akt (pan) (40D4) Mouse mAb (Sepharose® Bead Conjugate) (lane 2). 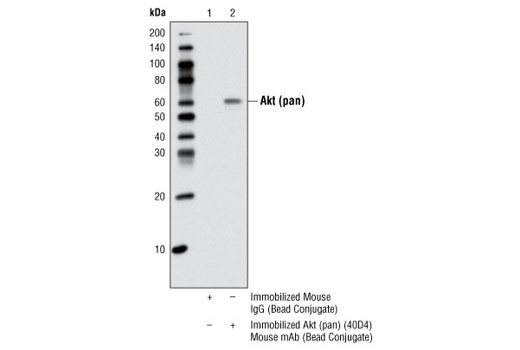 The western blot was probed using Akt (pan) (11E7) Rabbit mAb #4685. Akt (pan) (40D4) Mouse mAb (Sepharose® Bead Conjugate) detects endogenous levels of total Akt protein. This antibody does not cross-react with other related proteins. Monoclonal antibody is produced by immunizing animals with a synthetic peptide corresponding to residues near the carboxy terminus sequence of human Akt protein. This Cell Signaling Technology (CST) antibody is immobilized via covalent binding of primary amino groups to N-hydroxysuccinimide (NHS)-activated Sepharose® beads. Akt (pan) (40D4) Mouse mAb (Sepharose® Bead Conjugate) is useful for immunoprecipitation assays. The unconjugated Akt (pan) (40D4) Mouse mAb #2920 reacts with human, mouse, rat, and monkey Akt protein. CST expects that Akt (pan) (40D4) Mouse mAb (Sepharose® Bead Conjugate) will also recognize Akt in these species.